I am frequently asked what a “typical day” looks like for me. I never know what to say. It’s a legitimate question, and I appreciate the interest in what I do. While youth work is the most natural thing in the world to me, I understand that many of you have no idea how it fills a life, day in day out. The problem is I don’t have a typical day. I don’t even have a typical week! Youth ministry happens in seasons – there are busy times and light times – and lightning bolt moments, where months of building rapport leads to a really important conversation with a kid. And then the tasks that make up my work are crazy and varied depending on the “season”… it’s all a bit of a shemozzle. However, I have been inspired by Guillaume of Bethel, who has been sending weekly emails explaining a bit about what has been happening with Bethel and what his life/ministry looks like in that week. I am planning to do something similar – not every week, that would get old fast! – but enough to give you a glimpse at what it looks like to work full time with TCKs in Asia. I love what I do, and I’m excited to share my insane life with you a little better. Booked time with my flatmates – our different schedules mean that since Viki moved in a month ago we haven’t spent any time together! I made yummy spinach lasagne for dinner, we chatted about stuff, and painted nails. It was fun! (Viki is a 28 year old Chinese girl who is very sweet. We like her a lot! Our last flatmate, Louise from Norway, moved out to be closer to school). 3+ hour meeting with Joe, CCC youth pastor and close friend, going over what we’ll be doing in the youth ministry this semester. Started planning this year’s Baccalaureate – something like a commissioning service we run for graduating seniors every year. Ran a “chapel” service for IAB students at Peters (restaurant). IAB is a Christian international school that has been going through some major difficulties this year. I visit IAB most Wednesdays, to attend their assembly (chapel), visit with teachers/staff/art class, and then hang out in the lunch room with the students. School was not happening this week so we gathered kids together to pray, worship, and encourage each other. This is the second one we’ve done. About 2 months ago the senior campus (grade 6-12) closed for a few days on very short notice Joe and I figured that since we couldn’t go to school to hang out with the kids we’d do our own chapel at a well-known restaurant. It was a great time. This week’s chapel was wonderful as well – 40+ people came (mostly students); there was lots of prayer, some singing, and a lot of tears. Tears flowed as students prayed over the seniors (grade 12 students), for whom the uncertainty has a deeper stress as they look ahead to graduation. The two grade 12s playing guitar continued to play background music while they were prayed over. Watching kids pray with such intensity was very touching. I love these kids so much! Bongos! Our middle school youth group, for kids in grades 6-8. We had a big group this week, 44 people altogether (35 students, 4 student leaders, and 5 regular adult leaders). 4 kids were there for the first time and another was pretty new, too. It was a fun night – I miss my kids when we’re on break for a few weeks. Joe taught a great lesson on baptism and 8 kids expressed interest in being baptised later this year. Talked with a parent about their daughter and how to best work together to serve her needs. Rev! 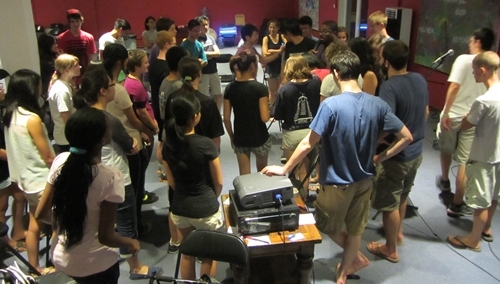 Our high school group (grades 9-12) had its first week back, another big one with 44 people (35 students). The bus to/from the city was pretty full – 18 people and a lot of fun. (Our church subsidises a bus to take students who live in the city, rather than in the expat community to the north where church meets, to youth group and home again). I discovered later that the bus broke down shortly after dropping me off and the four remaining students ran back down the on-ramp and jumped a fence to get to the subway station and go home that way instead! Met with 5 other TCK workers to discuss possibilities for expanding into more ministry to TCKs outside Beijing, and funding these ventures. We also talked about a few upcoming Beijing events. A little Chinese boy yelled “hello” at me so I replied. I normally ignore adults who yell “hello” at me, but I usually reply to the kids. Some happily converse with me, others get confused that the white lady is speaking Chinese. This kid seemed to lean toward the latter. He asked what I was carrying so I showed him, “Fresh flowers. Pretty, aren’t they?” he nodded quietly; I smiled and walked inside. Met with CCC youth leaders to discuss the upcoming semester – what we will teach on, what events are coming up, and who wants to get involved doing what. I stayed back to talk to Joyce after about potential girls’ group and bible studies – we had some great ideas and found ways to integrate our different gifts and passions. Very exciting! I then took some time on my own to work out what this might look like in practise and what work I’ll need to do to make it happen. Spent 3+ hours going over my expenses – my church helps pay certain ministry expenses, and I was waaaaay behind on the paperwork! Worked on a new bible study – a 6 week Sunday afternoon study for grade 9-12 girls who want to go deeper than we have time for during our normal youth activities. I’ll start it shortly after Chinese new year. Another taxi moment – it was a flashback to years gone by when the lady who drove me to church under-revved her car the entire way. I think the only time she got the car above 2000rpm was on the highway, where she was still going 20+ km/h below the speed limit. The chronic under-revving was a constant companion in my first few years here but it happens FAR less often now (thankfully). Church – the youth go downstairs for our own message during the service, and although this wasn’t the first one of the year it was the first one I was at. We had 106 people in the youth message, and lots of interest in some mission trips we’ll be doing this year. Hung out with middle school girls – I took one girl out for lunch and had two of them over for manicures and a movie in the afternoon. Famine For China – worked on stuff for this fundraising project happening at the end of February. Youth from three expat churches will go without food to fundraise for several charity projects in the Beijing area. We did the World Vision 30 hour famine the last two years, and raised a total of over $60,000 USD! Emails – oh the unending stream of emails that make up my life, organising different events, connecting people to things… it never stops. In reality, a LOT of my time is spent on a computer! Called home – talked to my Mum for only the second time since Christmas. My parents and I have all been travelling so it was nice to catch up, including Mum passing on what she’s gleaned about my sisters’ lives from facebook, since I haven’t got a working vpn at the moment and therefore can’t see it in China. I should probably just call my sisters sometime and ASK them what’s going on, huh? Anyway, that is what I did in my first week back at “work”. I hope that helps you understand how random and crazy a week of youth work can look. There’s no clear distinction between being at work and being at home. There’s no start time and stop time. Most of my ministry time happens outside normal work hours because it’s when kids aren’t in school – so nights and weekends. While there are some regular weekly events I attend, a lot of my time is spent doing tasks that are different every single week – the time I spend hanging out with kids, the events I plan – there’s always work but not much of a “typical” week.